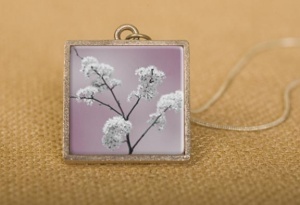 Experience Karin’s new photo pendants, the photography that you can wear as jewelry. These pendants are in four different sizes and focus on some of Karin’s work like a simple image of a flower, an overall scene of the beach or abstract images. 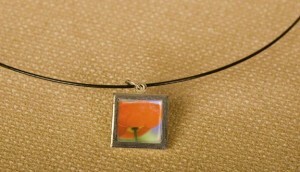 The pendants are silver plated and a glass cover sits on the top of the image. The pictures themselves are printed on archival photo paper which are then coated and protected before being sealed under glass. The necklace is either a silver chain or a black choker. See all current sizes and pricing. 1. A stylish silver rectangle photo pendant measures 23mm wide and 32mm long (7/8″ X 1.25″) and it comes with a 18″ silver snake chain. See all the options for this size. 2. 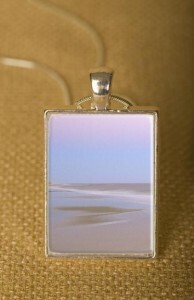 This long pewter rectangle pendant measures 18mm wide and 42mm long. It comes with a 24″ Antique Silver Vintage style necklace with lobster clasp. See all the options for this size. 3. This one inch square, vintage silver pendant feature the original photography of Karin Connolly and comes with a 18″ silver snake chain. See all the options for this size. 4. The “mini” pendant measures 12.5mm by 12.5 mm and is a fun and playful one. It comes with a 18″ Black Choker with a screw clasp. See all the options for this size.